The Hypergrid Adventurer’s Club is a great way of exploring the metaverse; they get together weekly to poke around new places outside of Second Life. I still don’t have the basics of hypergridding, so it’s really nice to have more seasoned explorers along to help me out. Last trip we visited FleepGrid, Fleep Tuque’s private grid. Fleep works for the University of Cincinnati, and she’s the most clever avatar I know; she runs FleepGrid on an old Pentium 4 she had in her basement. In her basement! Fleep is also a very talented content creator. Her orientation area is stunning. But what I really liked was this illustration of the differences between virtual worlds. Second life is like the New York City of the Metaverse, full of people, culture and events, but it’s a WALLED GARDEN. You can’t travel to other places, you can’t back up your creations or take them with you to other places, and it’s very expensive to rent or buy land there. Opensim grids and standalones are like smaller towns, villages and houses popping up all over the Metaverse; land is either free or much cheaper than the big city, you can travel to and from Hypergrid-enabled locations, take your avatar and things with you, and backup your stuff. 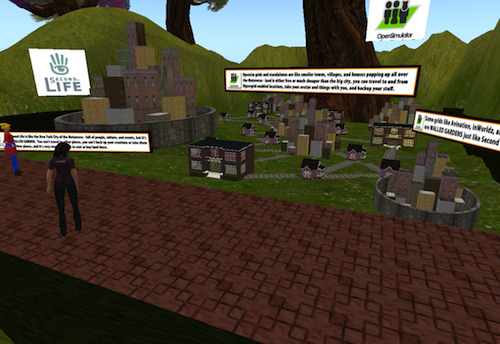 Some grids like Avination, InWorldz, and SpotOn3D are WALLED GARDENS, just like Second LIfe. I’m not keen on walled gardens myself, and I think they are only going to become more of an issue as time goes by. It was a fun and informative visit. If you’d like to try exploring the Hypergrid on your own, you can always use John (Pathfinder) Lester’s list of sites, or if hypergridding is a bit intimidating for you, just join Open Sim and use Firestorm or the Imprudence Viewer to tootle around in your avatar for a while. Nice writeup of our trip, Ellie. I’m glad you had a good time. I too was totally impressed by Fleep’s work. Thanks for the nice comments Ellie! It was so great to have visitors, I’m glad you had fun! The Opensim walk-through orientation is still in draft form, I hope to greatly improve the “exhibits” over time since most of the builds right now are pretty hastily put together. Anyhow thanks again for visiting and will hope to see you again sometime!